Although the style has been around for quite some time, I just love me some wrist candy especially with the fun summer months around the corner. 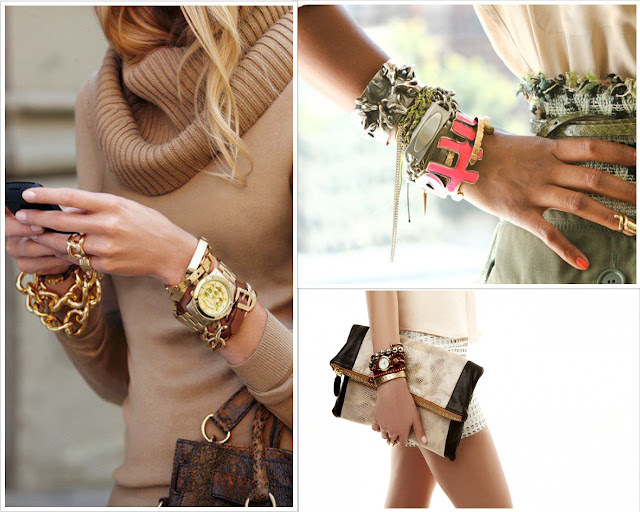 Layering bracelets is something you can totally have fun with to give any outfit that extra pop of individuality. Start off by thinking about what you are wearing in terms of colour and style. Although you can have a lot of fun with stacking bracelets it will still look best when there is cohesiveness between the outfit and accessories. So pull out what ya got and start sorting bracelets within the same colour story. Whatever the hue of your main colour is needs to compliment the type of metal. So if you are wearing earthy pastels stick to something like rose gold. If you want to pack a punch add a bright colour that's within the same family as what your wearing. If you are in light pink make a statement with a hot pink bracelet like the one below. However if you are someone that is wearing bright neon's for this season then I know already you aren't shy to stand out SO go with bold gold! In addition to your colour story you have to think about what your style is. If you are wearing something more classic like a soft summer dress then stick to those more delicate pieces like pearls, thin chains and Tiffany's popular bead bracelet. If you are in a more casual outfit you can get more edgy by pairing together leather cuffs and a chunky watch. Once you have decided which pieces work well together you want to be a bit strategic concerning their placement so they are all seen. Start with your biggest statement piece in the middle and start to work around it. Each bracelet next to the other should be relative in size so one isn't dominating the next. To avoid this make sure the little guys aren't next to your biggest piece for example. Give them a chance and let them hang out together! Remember layering bracelets is unique to you so rock out with whatever feels good to you because that is what makes this trend so much fun! I want to see what you have come up with so send it to me and I will tweet my favourite 'wrist candy'!! I emptied out my jewelry box and paired up what I had. Below are a couple looks that I came up with. 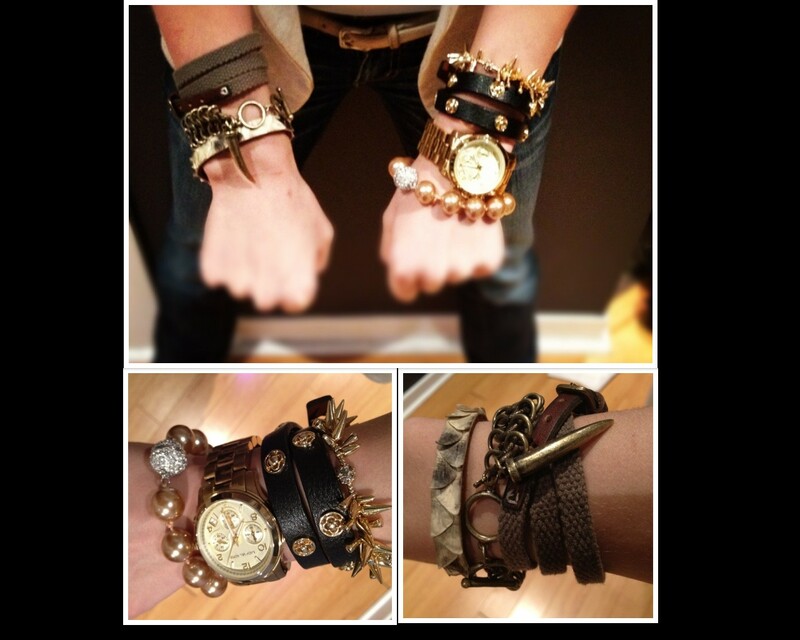 I'm looking forward to adding a few more pieces to my wrist candy collection over the next couple of weeks. I think I will start with a couple from Mondays "Online Addicted" post!! 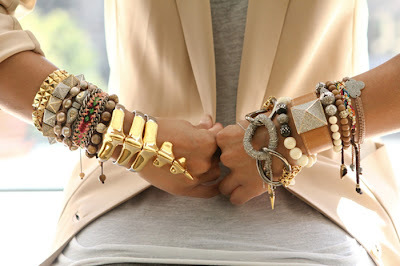 You have some seriously fabulous wrist candy, and we just love the way you put it all together! We're feeling totally inspired right now!